Key Difference: Pasteurization is the process of heating food, specifically liquids, to a specific temperature to slow microbial growth in the food. Sterilization refers to the process of eliminating all forms of bacteria from any product. 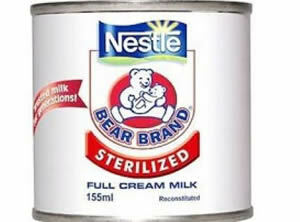 Pasteurization and sterilization are common terms that are heard in the fast moving consumer goods (FMCG) industry. These terms refer to processes that are used to increase the shelf life of a particular product, most commonly liquids. Both processes are responsible for eliminating bacteria from the food that causes the food to become contaminated. Although both processes seem to perform the same function, they are different from each other in multiple ways. See Skimmed Milk Vs. Pasteurized Milk. Pasteurization is the process of heating food, specifically liquids, to a specific temperature to slow microbial growth in the food. Pasteurization requires rapidly heating the liquid to a specific temperature for a specified time, followed by rapid cooling and then sealing. This process kills the heat susceptible organisms and their spores. Pasteurization is named after microbiologist Louis Pasteur, inventor of the process. Pasteur initially invented the process to keep wine and beer from going sour; however, this process is now used very commonly for milk. Notice, the milk cartons saying pasteurized or homogenized on the cover. When pasteurizing a liquid, the said liquid is heated to below the boiling temperature and then rapidly cooled. For example, milk would be heated at a temperature of 145°F (63°C) for 30 minutes. There are two types of heating processes used for milk under pasteurization: High-temperature, short-time (HTST) and Ultra-high temperature processing (UHT). 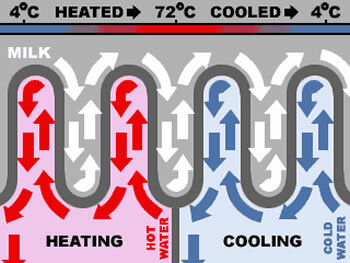 In HTST, milk is passed through metal pipes that are surrounded by hot water and heated to 72°C (161°F) for 15 seconds. The milk is then cooled and sealed. In UHT, milk is maintained at a temperature of 138°C (280°F) for a minimum of two seconds. The HSTH process provides milk with a refrigerated shelf life of two to three weeks, while UHT allows pints of milk to last longer, approximately two to three months. Appert would cook food to a high temperature, cool it and then sealed the food in airtight bottles that allowed the food to be preserved for long periods of time without spoiling This process was later adapted for canned foods. In order to sterilize milk, it would be heated to a high temperature that would kill all the bacteria present in the milk. Once all the bacteria are killed, the milk is then sealed in airtight containers and cartons. Sterilization allows food and liquids to be preserved for long periods of time; however, it can also eliminate any beneficial bacteria that may be present in the food as well. Additionally, the process also changes the taste of the food. Sterilization is commonly used in medical fields to keep the bacteria or viruses from spreading and contaminating everything. See: Sterilization Vs. Sanitization. Pasteurization is the process of heating liquid to a specific temperature for a specific time period to reduce microbial growth. Sterilization is the process of eliminating all bacterial growth from various different objects. Kitchen sinks and kitchen faucets are among the many things you can find online.